Just a month left for Mobile World Congress 2018, Barcelona, Spain. And we at CDN Solutions Group are very much excited not because we are going to be at this event for the first time, but also because it is the world’s largest gathering of the mobile industry. As an app development service provider company, we think MWC 2018 will be a great platform to showcase how CDN Solutions Group can help deliver complete, integrated mobility solutions. If you are attending Mobile World Congress 2018 Barcelona event, be sure to visit us at our stand #7L81 in Hall 7. We will showcase some of our outstanding solutions developed using emerging technologies and also share vision of CDN Solutions Group in the mobility space for the coming year. CDN Solutions Group Mobility Solutions – With over 800+ mobile apps developed using emerging technologies such as Internet of Things (IoT), Augmented Reality (AR), Virtual Reality (VR), Wearable, Blockchain, Beacon, Hardware Integration, etc, with most of the apps developed by us get featured in app store, received many awards by top research firm for our work, CDN Solutions Group becomes the first choice when it comes to mobile app development. Visit our booth #7L81, Hall 7 in Mobile World Congress 2018 Barcelona for a quick demo of the Marketplace, and learn how you can find the right solution for your business needs. CDN Solutions Group Latest Technology Solutions – CDN Solutions Group is an award winning technology solutions provider organization that provide end-to-end technology solutions that solve all your business pain areas of IT. Learn how we can help you to overcome from your business pain areas at MWC 2018 Barcelona. So, overall, we are very excited to become a part of Mobile World Congress 2018 where we can discuss about different kinds of real time problems people are facing in business and provide the most sensible solution to them, that only anyone can expect from us. So what are you waiting for, contact us here to schedule a meeting at MWC 2018 Barcelona and visit our stand #7L81 in hall 7. 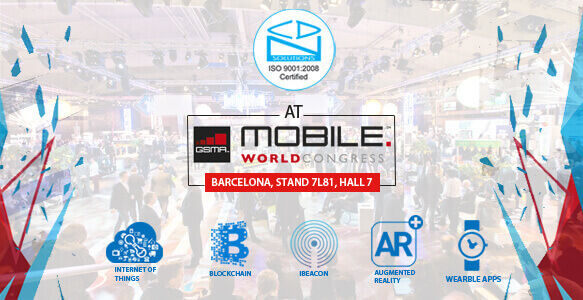 P.S – Our team of delegates will be available in Germany as well from 5th – 9th March 2018 after the MWC event. So if you are in Germany, Spain or other close regions and in search of IT outsourcing partner in Europe, then we can meet.